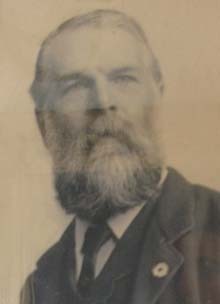 [ABOVE] A portrait of Clarence Edmund Fry (1840-1897), the eldest son of Edmund and Caroline Fry. 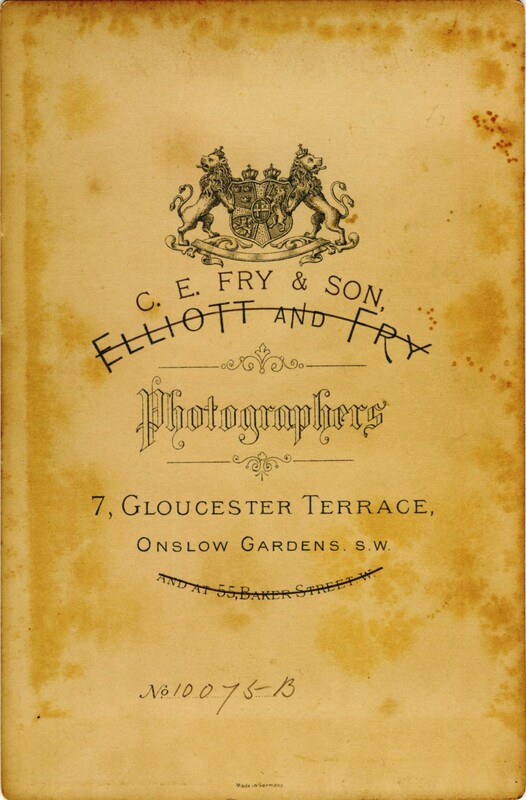 In 1863, Clarence E. Fry entered into partnership with Joseph John Elliott (1835-1903) to form the famous London photography firm of Elliott & Fry. [ABOVE] The trade plate of the photographic firm of Elliott & Fry taken from the reverse of a cabinet portrait produced in the 1880s. 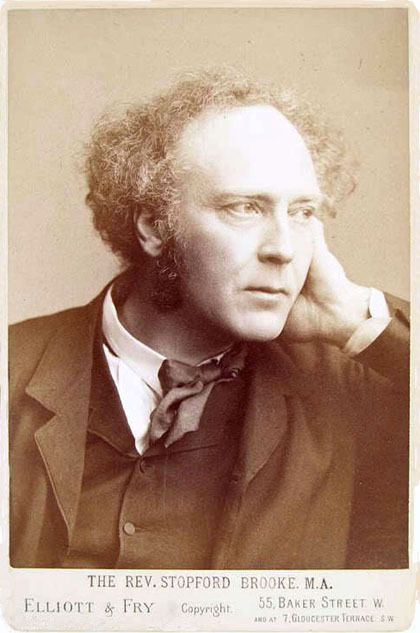 In 1863, the photographer Clarence Edmund Fry (1840-1897), entered into a business partnership with Joseph John Elliott (1835-1903) to form the famous London photography firm of Elliott & Fry. The following year, Clarence Fry's sister, Elizabeth Lucy Fry (1844-1931), married Joseph John Elliott, Clarence's business partner. 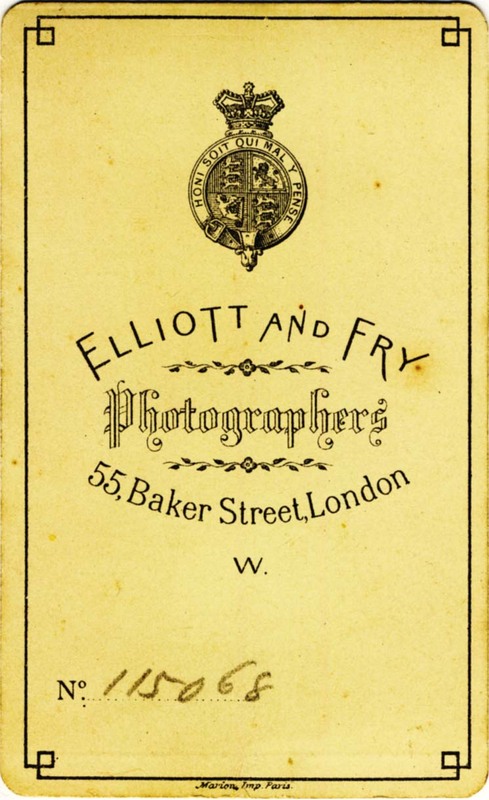 The firm of Elliott & Fry ran a successful portrait studio at 55 & 56 Baker Street, London between 1863 and 1919. The firm continued under the name of Elliott & Fry even after the death of Clarence Edmund Fry in 1897. Clarence Edmund Fry, was born in Plymouth, Devon, on 8th February 1840, the eldest son of Caroline Mary Clarence and Edmund Fry (1811-1866), a carver & gilder who later ran a print-publishing business in Plymouth. 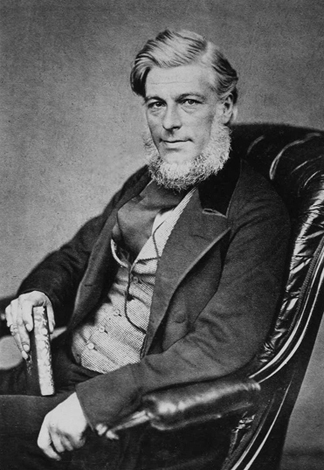 Clarence's father, Edmund Fry was born in Bristol on 18th September 1811, the son of Harriet Windover Reeves and Edmund Fry senior, a bookseller and stationer. By 1836, Edmund Fry was recorded as a bookseller, stationer and artist's colourman at Treville Street, Plymouth. From the late 1830s, Edmund Fry (1811-1866), collaborated with his father, Edmund Fry senior, a London bookseller, in publishing books, pamphlets and coloured lithographic prints, usually depicting ships and yachts. After the death of his father in 1841, Edmund Fry junior, continued his print publishing business at 43 Union Road (Street), Plymouth. [ABOVE] Mrs Caroline Mary Fry (1809-1879). 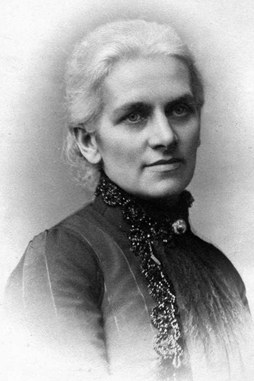 A school teacher by profession, Mrs Caroline Fry ran a Quaker preparatory school in Brighton during the early 1860s. [ABOVE] Edmund Fry junior (1811-1866), a Quaker and peace campaigner. A former print-seller, Edmund Fry gave lectures in Brighton promoting pacifism. In July 1837, on the Isle of Guernsey, Edmund Fry junior had married Caroline Mary Clarence (1809-1879), the daughter of Richard and Elizabeth Clarence of London. Both Edmund Fry and Caroline Clarence were members of the Religious Society of Friends (commonly known as Quakers), nonconformist Christians who held pacifist views. The union of Edmund Fry junior and Caroline Clarence produced at least five children - Clarence Edmund Fry (born 1840, Plymouth), Walter Henry Fry (born 1841, Plymouth), Hubert Oswald Fry (born 1843, Plymouth), Lucy Elizabeth Laughton Fry (born 1844, Plymouth) and Allen Hastings Fry (born 1847, Plymouth). Around 1856, after a few years in Croydon, Surrey, Edmund and Caroline Fry moved to the Sussex seaside resort of Brighton with their five children. All five children became connected with either art or photography. Hubert Oswald Fry was a promising artist, but sadly he died in 1863 before reaching his 21st birthday. It appears that around 1865, Walter Henry Fry was working as a photographic artist in partnership with Antonio Lombardi Martinucci and was operating a photographic portrait studio under the name of Lombardi & Fry. 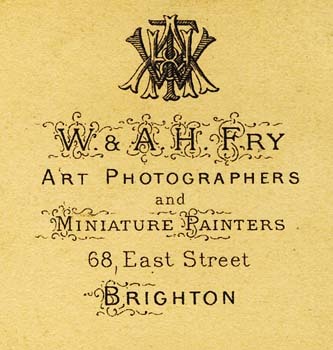 In the Summer of 1867, Walter Henry Fry and his younger brother Allen Hastings Fry established their own photographic studio at 68 East Street, Brighton under the name of W. & A. H. Fry. [ABOVE] The trade plate of the photographic studio of W. & A. H. Fry of 68 East Street, Brighton. The proprietors, Walter Fry and Allen H. Fry, were younger brothers of Clarence E. Fry. [ABOVE] Mrs Lucy Elizabeth Elliott (1844-1931), the sister of Clarence Edmund Fry and the wife of the photographer Joseph John Elliott of Elliott & Fry of London. Lucy Elizabeth Fry was born in Plymouth on 24th June 1844, the only daughter of Caroline and Edmund Fry. 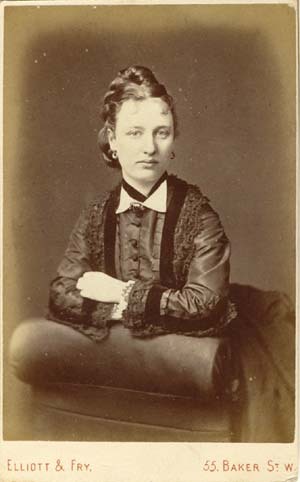 In 1864, at Brighton, Lucy Fry married the photographer Joseph John Elliott (born 1835, Croydon, Surrey), her elder brother's business partner. [PHOTO: Courtesy of Michael Mollet and Winterbourne Family History Online] Clarence Edmund Fry appears to have become a professional photographer during the late 1850s. It is reported that for a time he worked as a portrait photographer for the well-known Scottish firm of George Washington Wilson & Co. 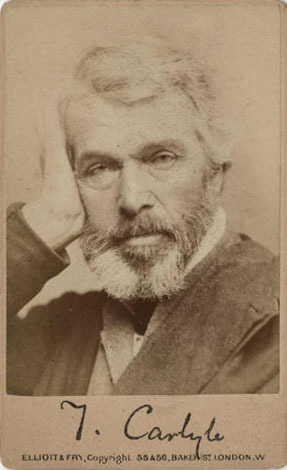 In 1863, Clarence Edmund Fry entered into a business partnership with Joseph John Elliott (1835-1903) to form the famous London photography firm of Elliott & Fry. Clarence Fry's business partner Joseph John Elliott, married Clarence Fry's sister Elizabeth Lucy Fry at St Nicholas's Church, Brighton, on 20th August 1864. On 7th January 1865, Clarence Edmund Fry, who was then approaching his 25th birthday, married Sophia Dunkin Prideaux (born 1838, Modbury, Devon) at Brighton. It is likely that the couple met through their photographic work. Sophia Prideaux, Clarence's bride, was a photographic colourist by profession. At the time of the 1861 census, Sophia Prideaux was residing with her widowed mother, Mrs Mary Prideaux (born c1815, Modbury, Devon) and two sisters at 19 Buckingham Place, Brighton. Her two sisters were employed as school mistresses, but twenty-three year old Sophia Prideaux was working as a "Photographic Colourist". On 13th November 1865, Sophia Fry gave birth to a son, named Clarence Edmund Fry, after his father. 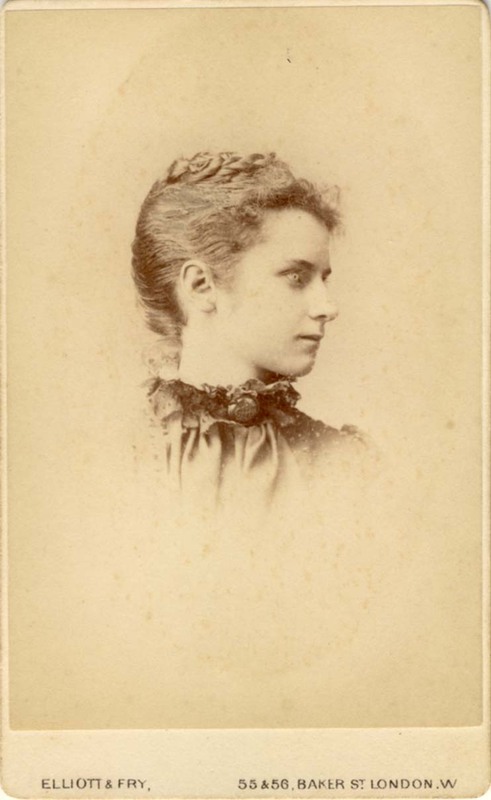 In adulthood, Clarence Edmund Fry junior become a photographer and, in his late twenties, he entered into a business partnership with his father, establishing the photographic portrait studio of C. E. Fry & Son in South Kensington, London. (See below). [ABOVE] Mrs Sophia D. Fry (born 1838, Modbury, Devon) the wife of the London photographer Clarence Edmund Fry. A note with the photograph states that the portrait was taken when she was residing at "Rough Down, Northwood, Middlesex" ,adding "for 30 years lived at Watford, Hertfordshire, about 4 miles from our present home". Joseph John Elliott and Clarence Edmund Fry opened their first photographic studio at 55 Baker Street, London in 1863. 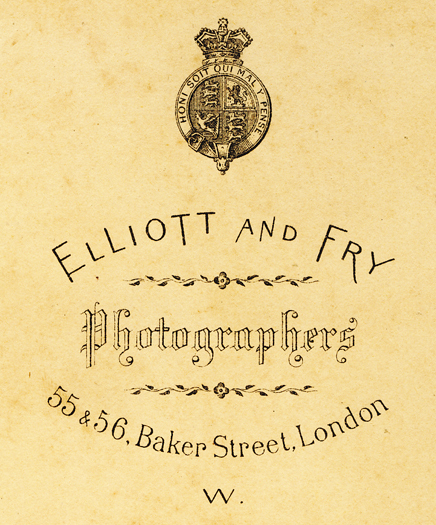 Elliott & Fry's photographic portrait studio at 55 Baker Street was in business until 1919. The partnership between Joseph John Elliott and Clarence Edmund Fry was dissolved on 31st July 1887, but the studios in Baker Street continued under the Elliott & Fry name. 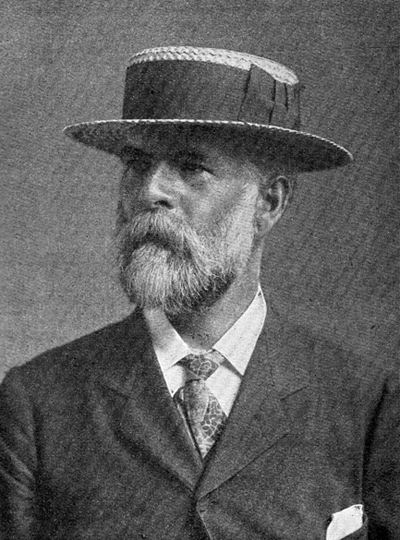 Joseph John Elliott took control of the studio at 55 Baker Street while Clarence Edmund Fry retained an interest in the Elliott & Fry branch studio at 7 Gloucester Terrace, Onslow Gardens, South Kensington, which had been established around 1886. Clarence Edmund Fry became a member of the Photographic Society of London (later known as the Royal Photographic Society) in November 1886. Clarence Edmund Fry presumably managed the studio of Elliott & Fry at 7 Gloucester Terrace, Onslow Gardens, S. W. London until about 1893. It appears that between 1887 and 1892, the studio of Elliott & Fry at 55 Baker Street, London was run by Joseph John Elliott and his son Ernest Clarence Elliott (born 1873, Barnet). Died of heart attack at 7th hole of Northwood Golf Course, April 12 1897. 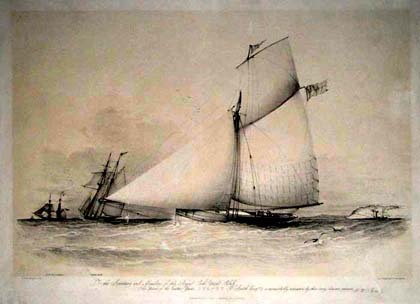 [ABOVE] The Cutter Yacht 'Cygnet' drawn by Oswald Walters Brierly and published as tinted lithographic print by Edmund Fry junior of Plymouth around 1842. Edmund Fry junior, the father of Clarence Edmund Fry, published coloured lithographic prints from 43 Union Road (Street), Plymouth during the early 1840s. The originator of this work, the well-known marine artist Oswald Walters Brierly (1817-1894) married Sarah Fry, Edmund Fry junior's sister, in Croydon in 1852. [ABOVE] Portrait of Clarence Edmund Fry (1840-1897), the eldest son of Edmund and Caroline Fry. In 1863, Clarence E. Fry entered into partnership with Joseph John Elliott (1835-1903) to form the famous London photography firm of Elliott & Fry. 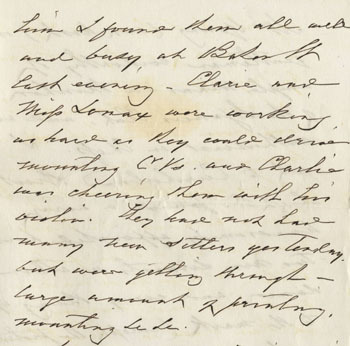 [ABOVE] Extract from a letter dated 22nd April 1864 from Edmund Fry to his wife Caroline, describing his visit to the Elliott & Fry studio at 55 Baker Street, London. In the letter, Edmund refers to his son Clarence Fry by his pet name of "Clare". 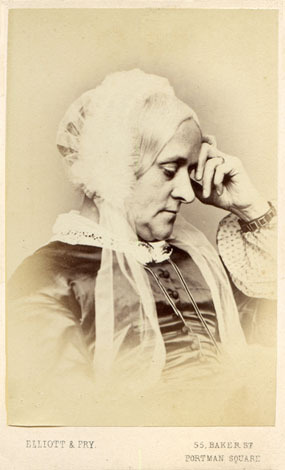 [ABOVE] Mrs Caroline Mary Fry (1809-1879), the mother of the photographer Clarence Edmund Fry (born 1840), co-founder of the photographic firm of Elliott & Fry of Baker Street, Portman Square, London. (c1872). 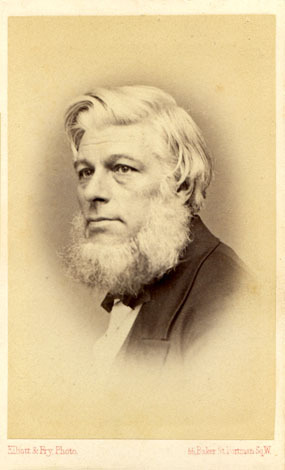 PHOTO: Courtesy of David & Nicholas Fry [ABOVE] Edmund Fry junior (1811-1866), the father of the photographer Clarence Edmund Fry. A Quaker and peace campaigner, Edmund Fry wrote his correspondence on "London Peace Society" headed paper. Joseph John Elliott was born in Croydon, Surrey, in 1835, the son of John and Mary Elliott. [Joseph John Elliott was baptised in Croydon, on 14th October 1835]. It appears that John Elliott, Joseph's father, was a cordwainer or shoemaker in Thornton Heath. The 1851 edition of Gray's Commercial and General Directory of Croydon records John Elliott as a cordwainer (shoemaker) at 9 Thornton Row, Thornton Heath, Croydon. [The photographer Joseph John Elliott later wrote an account of his life in Thornton Heath. The unfinished autobiography was recently published in 2008 by the Croydon Natural History and Scientific Society under the title "Victorian Thornton Heath remembered: being epoch 1 from the unfinished autobiography: the story of a varied life by Joseph J. Elliott, photographer (1835-1903)", edited by Brian Lancaster]. In 1851, at the age of 16, Joseph John Elliott, accompanied by his married sister and brother-in-law, set sail for Australia. It is reported that Joseph John Elliott had journeyed to Australia in search of gold. (In 1851, deposits of gold had been discovered at Ophir in New South Wales, leading to Australia's first 'gold rush'). Having no success with gold prospecting, Joseph John Elliott established himself as a photographer in rural New South Wales. Joseph John Elliott returned to England in 1859 and by 1861 he was residing in London. In London, Joseph John Elliott made the acquaintance of Clarence Edmund Fry (born 1840, Plymouth) a portrait photographer who had recently worked for the well-known Scottish firm of George Washington Wilson & Co. In 1863, Joseph John Elliott and Clarence Edmund Fry combined to form the firm of Elliott & Fry at 55 Baker Street, London. According to contemporary accounts, Joseph John Elliott ( at 28, the older of the two young business partners) was more of an entrepreneur and looked after the commercial side of the business. As one writer observed: "Suffice it to say that the success of the firm was very largely due to the energy and keen business judgment of its senior partner (i.e. Elliott)". On 20th August 1864, at St Nicholas's Church, Brighton, Joseph John Elliott married Elizabeth Lucy Fry (born 1844, Plymouth, Devon), the twenty-year old sister of his business partner Clarence Edmund Fry. The union of Joseph John Elliott and Elizabeth Lucy Fry produced at least eight children - Lucy Caroline Elliott (born 1865, Marylebone, London); Hubert John Elliott (born 1867, East Barnet, Herts. ); Mary Stuart Elliott (born 1871, Barnet, Hertfordshire); Ernest Clarence Elliott (born 1873, Barnet, Herts. ); Dorothy Elliott (1875, Monken Hadley, Middlesex); twins Howard Elliott & Kingsley Elliott (born 1879, Monken Hadley, Middlesex) and Clarence Elliott (born 1881, Hadley, Barnet, Middlesex). 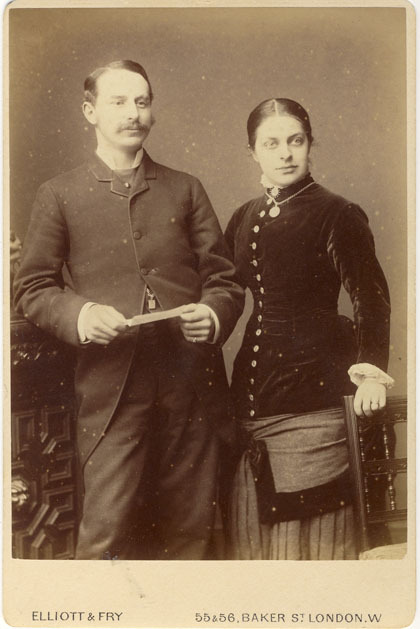 For the first few years of their marriage, Joseph and Lucy Elliott lived in the Marylebone district of London, but by 1867, they had moved to the London suburb of Barnet, setting up home at a house called "Underhill" in Monken Hadley, a village in East Barnet on the border between Hertfordshire and Middlesex. When the 1871 census was taken, Joseph John Elliott was recorded as a "Photographer - employing 14 men, 9 women & 4 boys" residing with his wife Lucy and their 3 children at Underhill, Monken Hadley, East Barnet. Around 1875, Joseph John Elliott and his growing family moved to Hadley House, Hadley Green, Barnet. When the census was taken on 3rd April 1881, Joseph John Elliott and his family were recorded at Hadley House. 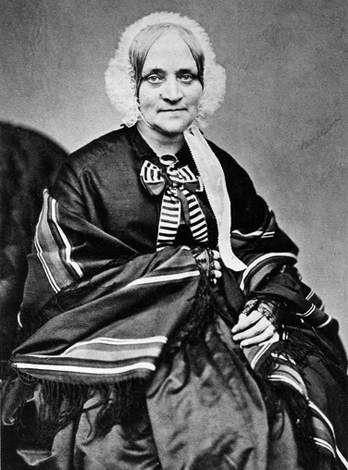 The 'Head of Household', Joseph John Elliott is described as a "Photographer", aged 45. Residing alongside Joseph Elliott and his wife Lucy at Hadley House were six of their (then) seven children. 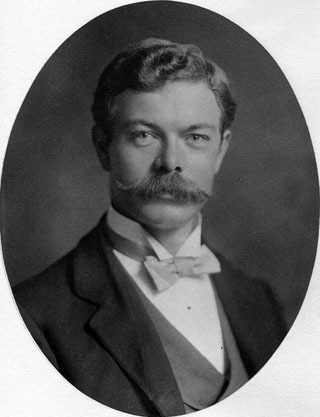 [Joseph and Lucy's eldest son, 13 year old Hubert John Elliott, was away at boarding school in Brighton. Their eighth child, Clarence Elliott was yet to be born]. Sharing their large house in Monken Hadley were two cousins and a nephew. One of the cousins recorded at Hadley House was Charles Marsh Schomberg, a nineteen year old photographer. The household was completed by six live-in servants. The partnership between Joseph John Elliott and Clarence Edmund Fry was dissolved on 31st July 1887. Joseph John Elliott brought his two eldest sons, Hubert John Elliott (1867-1955) and Ernest Clarence Elliott (1873-1910) into the family firm. Hubert John Elliott took control of the manufacture of photographic materials and his younger brother Ernest Clarence Elliott became the proprietor of the Elliott & Fry studio until his untimely death in 1910 at the age of 37. Joseph John Elliott died at his home in Barnet on 30th March 1903 at the age of 67. A successful photographer and manufacturer of photographic materials, Joseph Elliott left a sum of �67,658 in his will. scholar 15 Marylebone, London, Middx. The household was completed by 10 other individuals including 1 visitor, 3 relatives and 6 domestic servants. One of the relatives listed is Charles M. Schomberg, a nineteen year old photographer. [ABOVE] The photographer Joseph John Elliott and his family recorded at Hadlley House, Hadley Green, Barnet, Hertfordshire at the time of the 1881 census. When the census was taken, Joseph and Lucy Elliott's eldest son Hubert John Elliott (born 1867, East Barnet, Herts.) was away from home, boarding at Joshua Fayle's school in Eaton Place, Brighton. [ABOVE] Hubert John Elliott ((born 12th May 1867, Barnet), the eldest son of Joseph John Elliott and Lucy Fry photographed around 1887. When the 1901 census was taken, Hubert John Elliott was described as a "Photographic Materials Manufacturer" and in 1911 he was the Director of Elliott & Son's photographic plate and paper manufacturing business. [ABOVE] Clarence Elliott (born 1881, Hadley, Barnet, Middlesex), the eighth child of Joseph John Elliott and Lucy Fry, probably photographed by his father, Joseph John Elliott around 1885. 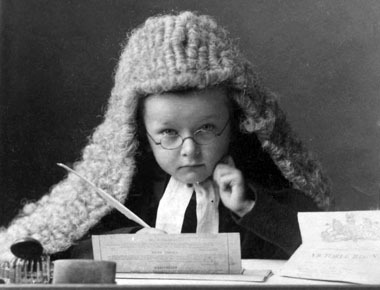 Four year old Clarence has been dressed up as a judge for humorous effect. An inscription with the photograph reads 'Clarence Elliott, 8th child of Joseph John and Lucy Elizabeth (Fry) Elliott of Hadley House, Barnet, at 4. Taken as a Judge saying "Repeat that, if you please".' As a young man Clarence Elliott studied horticulture and in adult life he worked as a landscape gardener. At the time of the 1911 census, twenty-nine year old Clarence Elliott was staying at Grayshott Hall in Haslemere, Surrey, working as a "Landscape Nursery Gardener". Clarence Edmund Fry came from a family that was closely connected to the Victorian art world. Although his mother's maiden name was Clarence, it is likely that Clarence Edmund Fry was named after his father's late brother, Clarence Fry (born c1810), an artist whose painting career was cut short when he was lost at sea as a young man. When the Fry family lived in Plymouth during the 1840s and early 1850s, Clarence's father, Edmund Fry junior (1811-1866), was the proprietor of a print-seller's shop in Union Road, Plymouth. Edmund Fry published coloured lithographic prints of the work of the leading marine artists of the day, including Phillip Mitchell (1814-1896), Nicholas Matthew Condy (1816-1851) and Oswald Walters Brierly (1817-1894). Edmund Fry junior and his family associated with the artists whose work was reproduced by the Fry printing firm. In fact, the relationship with these artists was so close that they became friends of the Fry family. One of the marine artists, Oswald Walters Brierly married Edmund Fry junior's younger sister, Sarah Fry (c1817-1870). Hubert Fry (born c1820), an artist who drew a picture of Captain Bulkeley's schooner yacht "Peri" (picture which was later published as a coloured lithographic print in the 1840s by Edmund Fry), was possibly a relative of Edmund Fry, the print-seller of Plymouth. 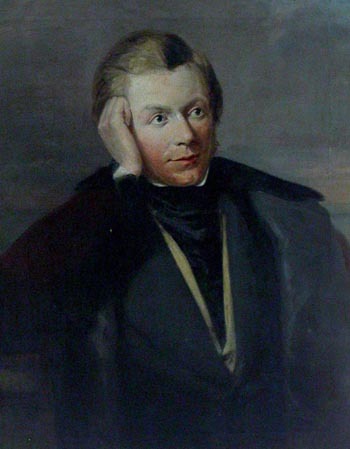 One of Edmund Fry's sons Hubert Oswald Fry (born 1843, Plymouth), might have been named after these two artistic relatives (Hubert Fry and Oswald Brierly). Hubert Oswald Fry became an artist like his uncles, but sadly he died in 1863 at the age of 20, before he could fulfil his artistic potential. 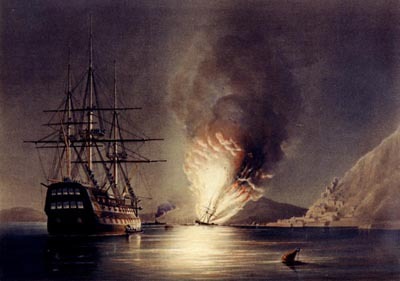 ABOVE] The Burning of the United States frigate "Missouri" at Gibraltar, 26th August 1843 by Edward Duncan, after a "sketch made on the spot" by Lt. George Pechell Mends, a coloured lithograph published by Edmund Fry junior of Plymouth. Edmund Fry junior specialised in the production prints on marine subjects. Clarence Edmund Fry was clearly passionately interested in art and a proportion of the fortune he amassed in running the hugely successful portrait studio of Elliott & Fry was spent on works of art. In August 1875, Clarence Edmund Fry commissioned the Pre-Raphaelite artist Dante Gabriel Rossetti (1828-1882) to produce a large oil painting of Astarte Syriaca, the Babylonian goddess of love and fertility, for the sum of �2,100, the largest amount ever paid to Rossetti for an easel painting. 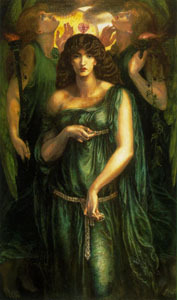 The work, entitled "Astarte Syriaca", but also known as the Venus Astarte, was completed by Rossetti by January 1877. The central figure was modelled on Mrs Jane Morris, the wife of fellow Pre-Raphaelite William Morris (1834-1896), the famous socialist artist and designer. Dante Gabriel Rossetti had fallen in love with Jane Morris and it is believed that she had been Rossetti's mistress in the years leading up to Clarence Fry's commission of the painting Venus Astarte in 1875. Clarence Edmund Fry was an important patron of the German-born artist Hubert Herkomer (1849-1914). Herkomer's parents had settled in Southampton in 1857. Hubert had first studied art at Southampton School of Art as a teenager, and then completed his training as an artist at the South Kensington Schools of Art. Clarence Fry might have first encountered Herkomer's drawings as engraved illustrations in The Graphic magazine published in the early 1870s (e.g. "A Sketch at a Concert given to the Italian Poor", The Graphic, 18th March 1871). During this period, Clarence Fry started to collect Herkomer's work. Around 1872, Fry purchased a watercolour by Herkomer entitled "The Frugal Meal". 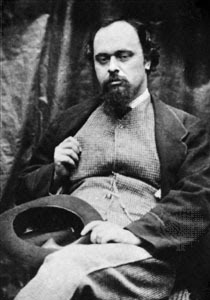 [ABOVE] A portrait of the artist Hubert Herkomer (1849-1914), photographed at the Baker Street studio of Elliott & Fry around 1878. Clarence Fry was an early patron of Hubert Herkomer, purchasing the artist's oil painting "The Last Muster : Sunday at the Royal Hospital, Chelsea" for the large sum of �1,200 in 1875. Herkomer included portraits of his patron Clarence Fry and Mrs Sophia Fry (the photographer's wife) amongst the packed congregation in the Chelsea Hospital's Chapel. Hubert Herkomer was born on 26th May 1849 in Waal, Bavaria, the son of Josephine and Lorenz Herkomer, a Bavarian wood-carver. In 1851, Hubert's parents took him to America, where the Herkomer family lived for the next six years. In 1857, Lorenz Herkomer and his family travelled to England and set up home in Southampton. Hubert Herkomer studied art at Southampton School of Art before training as an artist at the South Kensington Schools of Art. Hubert Herkomer established a reputation as an accomplished artist when he produced line drawings for The Graphic, an illustrated weekly newspaper, during the 1870s. Hubert Herkomer's early engravings were concerned with social themes (e.g. Low Lodging House, St Giles's, 1872; Christmas in a Workhouse, 1876) and he went on to produce powerful social realist paintings such as Eventide: A Scene in the Westminster Union Workhouse (1878); Hard Times (1885), and Strike (1891). 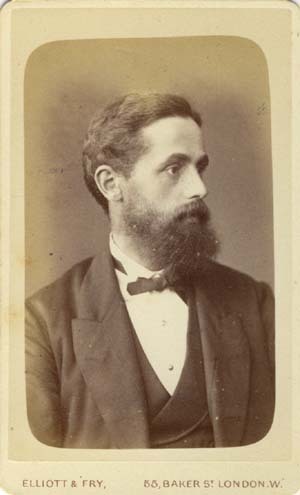 Hubert Herkomer exhibited his paintings at the Royal Academy and was elected an Associate of the Royal Academy in 1879. Herkomer established himself as a society portrait painter and among his sitters were the famous composer Richard Wagner, the art critic John Ruskin, Lord Kitchener and Robert Baden-Powell, founder of the Boy Scouts. Hubert Herkomer was made a full member of the Royal Academy in 1890. Between 1885 and 1894, Hubert Herkomer was the Slade Professor of Fine Arts at Oxford. Herkomer was knighted in 1907 by King Edward VII. Hubert Herkomer died at Budleigh Salterton in Devon on 31st March 1914, at the age of 64. Clarence Fry probably became fully aware of Herkomer's potential to create a large work in oils when the artist exhibited "After the Toil of the Day" at the Royal Academy in 1873. In February 1871, The Graphic magazine published an engraving by Herkomer entitled "Sunday at Chelsea Hospital", which showed elderly war veterans at a church service. In 1875, Herkomer worked up this black-and-white illustration into a large oil painting and gave it a slightly different title - "The Last Muster - Sunday at the Royal Hospital, Chelsea". Clarence Fry had agreed to buy the finished painting from Herkomer for �1,200. By this date, Clarence Fry was a friend and neighbour of Hubert Herkomer's as well as being his major patron. Hubert Herkomer had modelled one of the red-coated army pensioners on his white-bearded father Lorenz Herkomer (1815-1888), a Bavarian wood-carver. Herkomer also chose to include in the composition a portrait of his patron Clarence Edmund Fry. Together with a portrait of himself and a representation of his first wife Anna, Hubert Herkomer included Mr and Mrs Fry in the painting, placing them on the seats that lined the wall of the Chelsea Hospital chapel. When Hubert Herkomer was planning the oil painting version of "Sunday at Chelsea Hospital", he was a close neighbour of his patron. 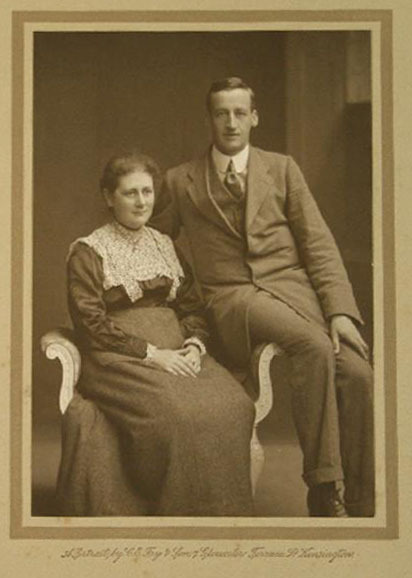 When their son was born in 1865, Clarence Edmund Fry and his wife were living near Watford in Hertfordshire. In 1873, Clarence Fry and his family were residing at a house near the railway station at Bushey in Hertfordshire. It is thought that after visiting Clarence Fry at Bushey, Herkomer decided to set up home in the Hertfordshire village. Herkomer later established an art school at his house in Bushey, which he ran from 1883 until 1904. 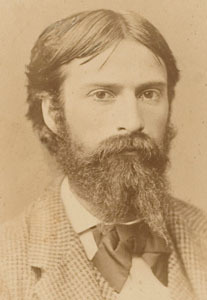 [ABOVE] A portrait of the artist Clarence Fry, who was Clarence Edmund Fry's uncle. Clarence Fry was a brother of Edmund Fry (1811-1866), who associated with a number of artists when he was operating a print-selling business in Plymouth in the 1840s. Clarence Fry the artist was lost at sea as a young man and this portrait is believed to have been painted posthumously by a fellow artist. 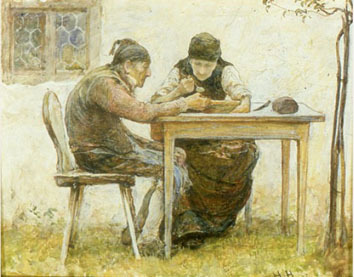 [ABOVE] "Abendbrodt - The Frugal Meal " (1872) a watercolour by Hubert Herkomer (1849-1914). This watercolour was purchased by Clarence Edmund Fry and marked the beginning of the photographer's patronage of this social realist artist. 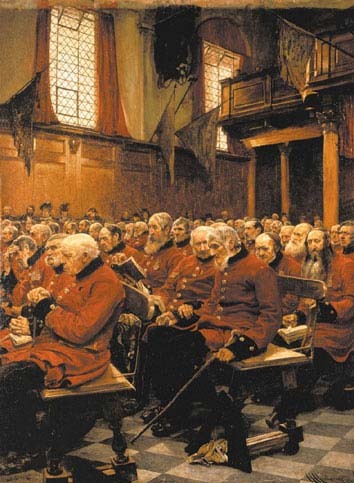 [ABOVE] "The Last Muster : Sunday at the Royal Hospital, Chelsea" (1875), an oil painting by Hubert Herkomer (1849-1914). Clarence Edmund Fry was an important patron of the German-born artist and Herkomer chose to include portraits of Clarence Fry and Fry's wife, Sophia, amongst the figures seated along the side wall of the chapel, right at the back of the picture. Clarence Fry is shown second from the left in the line of small figures seated in front of the panelled wall. A few seats away on the right is a representation of the artist himself. Hubert Herkomer, the artist who created the picture, is the bearded figure holding his hand to his head, as if deep in thought. Seated between the artist and his patron are two women in large hats, Mrs Anna Herkomer, the artist's wife, and Mrs Sophia Fry, his patron's wife. Clarence Fry paid Herkomer �1,200 for the finished painting, which went on to be well received at the Royal Academy and was awarded a gold medal at the Paris Universal Exhibition of 1878. [ABOVE] Portrait of Reverend Stopford Brooke, a cabinet portrait by Elliott & Fry of 55 Baker Street, London, W. and 7 Gloucester Terrace, London, S.W. (c1888). The registration of the copyright of Elliott & Fry's portrait of Rev. Stopford Brooke gives the author of the work as Clarence Edmund Fry, Photographer of Elmcote, Watford. The sitter, Reverend Stopford Augustus Brooke (1832-1916), was an Irish clergyman and writer who, in 1880, broke away from the orthodox Church of England and embraced Unitarianism. Celebrity Portraits by Clarence Edmund Fry of Elliott & Fry of London. William Ewart Gladstone, MP (1809-1898). British Liberal Statesman and Prime Minister. "Photograph of Mr W E Gladstone MP, nearly profile. Large head & shoulder." Copyright author of photograph: Clarence Edmund Fry, Elm Cote, Watford. Form completed 2nd October 1883. Registration stamp: 4th October 1883. Princess Beatrice and Prince Henry of Battenburg. Princess Beatrice (1857-1944) was the youngest daughter of Queen Victoria. Princess Beatrice's husband, Prince Henry of Battenburg (1858-1896), was an army officer and Governor of the Isle of Wight. "Photograph. Group of Princess Beatrice and Prince Henry of Battenburg, the latter sitting in chair, hands one over the other. The Princess leaning on the Prince's right shoulder - almost profile - her hands together easily." Author of work: Clarence Edmund Fry, Elm Cote, Watford. Form completed 7th May 1885. Registration stamp: 7th May 1885. Joseph Chamberlain (1836-1914). British Politician and Statesman. "Photograph of Rt Hon Joseph Chamberlain, head & bust, � face looking to the left, eye-glass cocked". Copyright author of work: Clarence Edmund Fry, Elmcote, Watford. Form Completed 3rd August 1893. 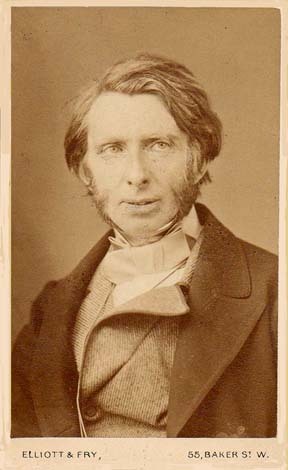 Thomas Henry Huxley (1825-1895). 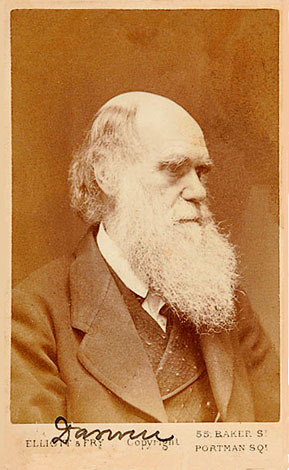 English Biologist and Anatomist and advocate of Darwin's Theory of Evolution. 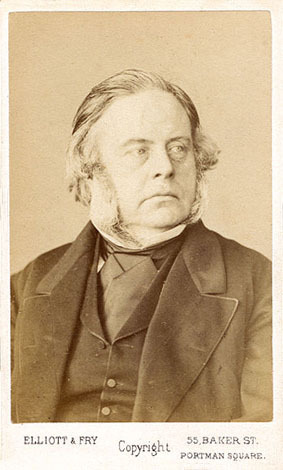 "Photograph of Rt Hon Thomas Huxley PC, � length, full face, showing to knees, right hand holding book, left hand holding spectacles". Copyright author of work: Clarence Edmund Fry, Elmcote, Watford. Form Completed 3 August 1893. Registration stamp: 4 August 1893. Clarence Edmund Fry junior was born at Watford, Hertfordshire, on 13th November 1865. By 1894, the Elliott & Fry studio at 7 Gloucester Terrace, Kensington, had been taken over by Clarence Edmund Fry and his twenty-nine year old son, Clarence ('Clare') Edmund Fry junior. From 1894 until beyond the end of the First World War, the studio at 7 Gloucester Terrace, South Kensington went under the name of C. E. Fry & Son. From 1900, Clare Fry was a member of the Royal Photographic Society. In 1901, Clare Edmund Fry was living with his parents at Roughdown, Watford Road, Ruislip, Middlesex. On the 1901 census return Clare Fry is recorded as "Photographer", aged 35. Clarence ('Clare') Edmund Fry junior died at Tunbridge Wells, Kent in 1939. 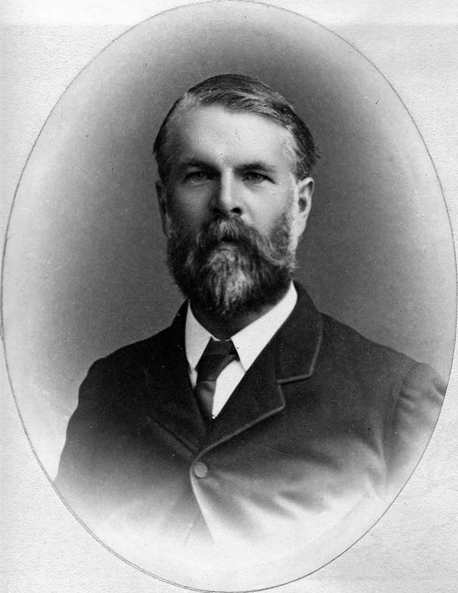 [ABOVE] Portrait of Clarence Edmund Fry junior (1865-1936), the only son of Sophia Prideaux and Clarence Edmund Fry senior (1840-1897). 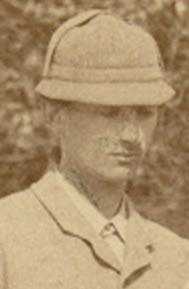 Clarence Edmund Fry junior was generally known as Clare Fry to distinguish him from his father, Clarence Edmund Fry senior. [ABOVE] Engagement photograph of Helen Beatrix Potter and William Heelis, taken at the studio of C. E. Fry & Son at 7 Gloucester Terrace, Kensington (c1912). 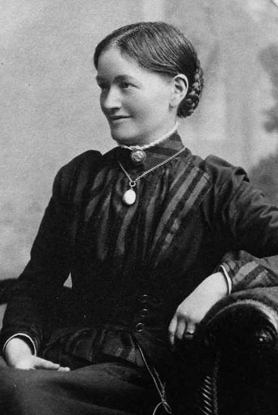 Helen Beatrix Potter ( 1866-1943), better known as Beatrix Potter, the author and illustrator of children's books, married William Heelis (1872-1945), a solicitor, in Kensington, London, on 14th October 1913. [ABOVE] A cabinet portrait of an unknown woman produced by the studio of Clarence E. Fry & Son of 7 Gloucester Terrace, Onslow Gardens, London S.W. (c1893). Clarence E. Fry and his son Clare Fry took over Elliott & Fry's former studio in Gloucester Terrace, Kensington in 1893. [ABOVE] The reverse of a cabinet portrait produced by Clarence E. Fry & Son of 7 Gloucester Terrace, Onslow Gardens, London S.W. (c1893). The name of the previous proprietors, Elliott & Fry, has been scored out and the name of the new owners of the studio, C. E. Fry & Son, has been added. Dr. Edmund Fry (1754-1835) Scholar and designer of type fonts. Joseph Storrs Fry (1769-1835) Head of the famous chocolate firm of J. S. Fry & Son. Thanks to Kate Greenwood and her aunt Mrs Erica Moore (nee Greenwood), for providing the Fry family portraits. Kate Greenwood's great, great grandfather was Walter Henry Fry, a younger brother of Clarence Edmund Fry. Erica Moore is a grandchild of Allen Elliott Fry, one of the sons of photographer Walter Henry Fry, a partner in the Brighton photography firm of W. & A. H. Fry. I am indebted to Michael Mollet, the Frenchay Village Museum and Ray Bulmer of Winterbourne Family History Online for making the wonderful collection of Fry Family Portraits available on the internet and for allowing me to feature a number of the portraits which relate to Edmund Fry and his family on my Sussex PhotoHistory website. 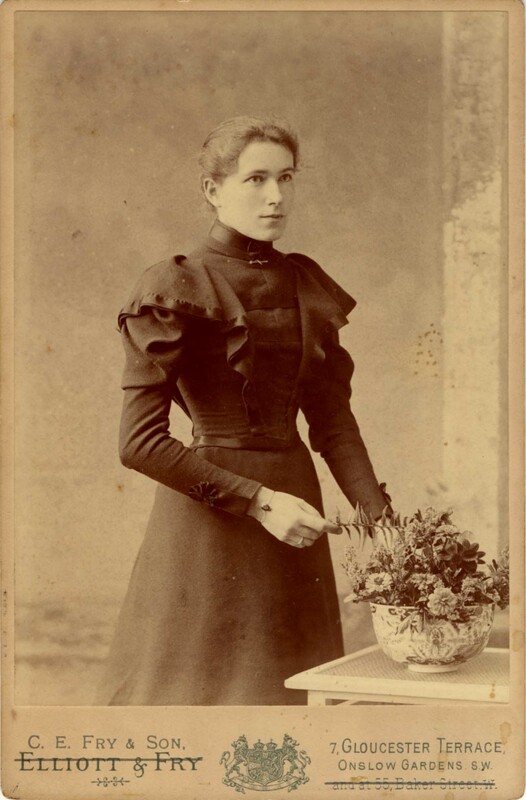 I am grateful to Marcel Safier of Australia for drawing my attention to the Fry Family Portraits featured on Winterbourne Family History Online. Paul Frecker has kindly provided biographical information on Clarence Edmund Fry.